Ocean Thermal Energy Conversion (OTEC) is a process that can produce electricity by using the temperature difference between deep cold ocean water and warm tropical surface waters. OTEC plants pump large quantities of deep cold seawater and surface seawater to run a power cycle and produce electricity. OTEC is firm power (24/7), is a clean energy source, is environmentally sustainable and is capable of providing massive levels of energy. A basic closed-cycle OTEC plant is shown in in the figure to the right. Warm seawater passes through an evaporator and vaporizes the working fluid, ammonia. The ammonia vapor passes through a turbine which turns a generator making electricity. The lower pressure vapor leaves the turbine and condenses in the condenser connected to a flow of deep cold seawater. The liquid ammonia leaves the condenser and is pumped to the evaporator to repeat the cycle. OTEC has long been challenged by high capital costs in a world of cheap energy. Recently, however, higher electricity costs, increased concerns for global warming, and a political commitment to energy security have made initial OTEC commercialization economically attractive in tropical island communities where a high percentage of electricity production is oil based. Even within the US, this island market is very large; globally it is many times larger. As OTEC technology matures, it should become economically attractive in southeast US. Makai has been involved with Lockheed Martin and the US Navy in focusing on the commercial development of 100MW OTEC plants for island communities like Hawaii and Guam. We have significant programs in heat exchanger design and testing, plume modeling, power module design, plant layout, cold water pipe handling and deployment, a pilot plant design, analyzing the power cable to shore, and bioplume modeling. 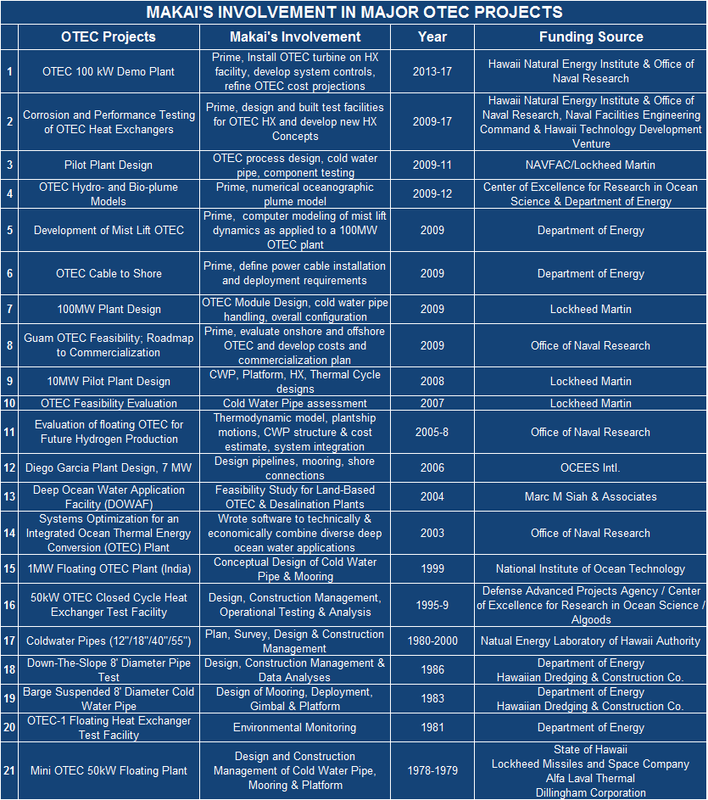 Much of the recent work at Makai has been leveraged from our OTEC SBIR study performed for ONR and managed by NAVFAC from 2005-2008 (project #10 in the table above) which recognized the potential of OTEC in today’s energy market and climate crisis. That study developed a detailed evaluation of short term floating OTEC plants providing electricity to shore and a long term OTEC industry manufacturing an energy carrier for the continental US. Initial Plant designs and analytical tools were developed that are major design tools being used today in OTEC planning. A development Road Map was created that is now being implemented. The subsequent projects, items 1-9, have been a direct consequence of this earlier SBIR work. Today, there is a healthy and growing OTEC program moving forward in the US. 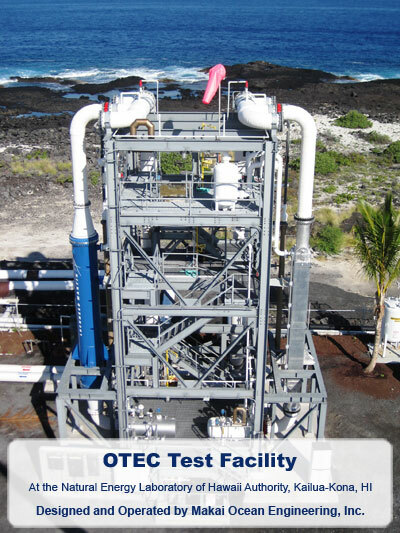 Makai received from the Small Business Administration the Region IX Contractor of the Year Award in 2010 for our work on this OTEC project and leveraging it into the significant OTEC program that is underway today. 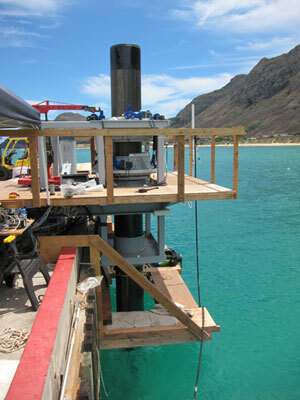 A new test facility is being built at the Natural Energy Laboratory of Hawaii (NELHA), on the Big Island of Hawaii. NELHA is a state-owned business technology park that provides warm and cold seawater to their tenants. The deep seawater is obtained via a 620-meter-deep 40″ intake pipeline, or a 914 meters deep 55″ pipeline. NELHA can furnish a total of 26,000 gpm cold seawater, with corresponding warm water flows. No other facility worldwide can provide such large flows of deep seawater. The heat exchanger test facility is a 40′ tall tower that supports up to three different evaporators, three different condensers, 24″ seawater piping, and an accurately instrumented ammonia working fluid piping system with two pumps and pressure vessels. The test facility will allow Makai to measure the performance of evaporators and condensers, as a function of water velocity, temperature difference, and ammonia flow rate. The figure shows the facility with a heat exchanger being tested on the left and a condenser on the right.